'Release, transport and fate of engineered nanoparticles in the aquatic environment' is the title of Arjan Markus' thesis which he already successfully defended. Nanotechnology has brought us many benefits, think of smartphones for instance, but also miniature sensors, important in medical applications, “lab-on-a-chip” to name but a few. Less spectacular perhaps, but equally important and widespread is the use of nanoparticles in personal care products, paints and coatings and reinforced polymers. As they are so small and are made from ordinary materials – zinc and titanium but also carbon, in the form of carbon nanotubes or spherical molecules – it is in general very difficult to distinguish them from natural soil or sediment particles. 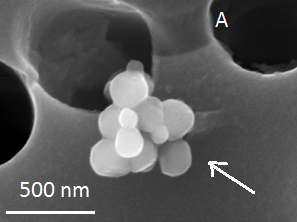 Often, electron microscopy in combination with other measurement techniques is used to identify these nanoparticles in water samples.Electron microscopic image of a cluster of nanoparticles, found in the sludge from a wastewater treatment plant. • Complement monitoring programmes, as modeling gives insight in the spreading of contaminants and the concentrations in which they occur. • Help understand the risks posed by the use of nanoparticles now and in the future. This was applied to the river Rhine. First, the release of nanoparticles from consumer products was estimated using literature data. Then a mathematical model for the fate of nanoparticles in the aquatic environment was set up, based on data and input parameters collected from published laboratory experiments. 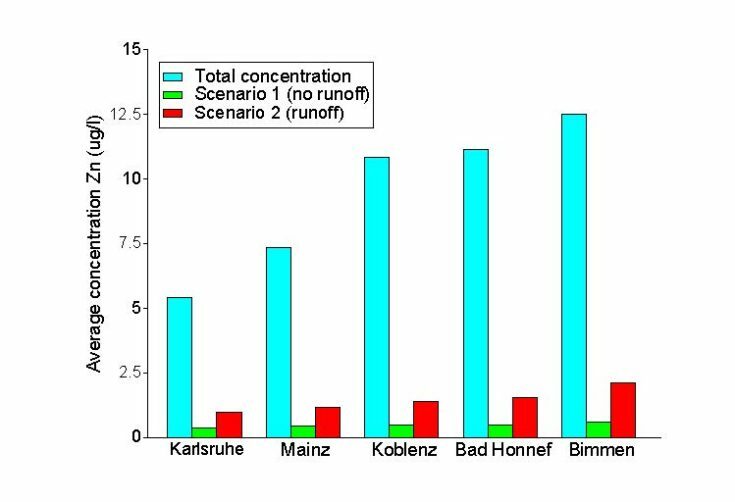 This knowledge together with information concerning the hydrology of the Rhine and the wastewater treatment plants in the Rhine basin was used to predict the nanoparticle concentrations under various release scenarios. Comparison of the concentration of zinc nanoparticles to the total concentration of zinc, showing the relative contribution. The model results suggest that nanoparticles are mostly attached to suspended matter – so-called heteroaggregation (to clot together) being the most important process. Therefore they are transported along with suspended matter and will settle in the sediment if the circumstances allow. To examine the environmental risk of nanoparticles one needs to be able to estimate the release of nanoparticles but also to understand the behaviour of suspended matter.